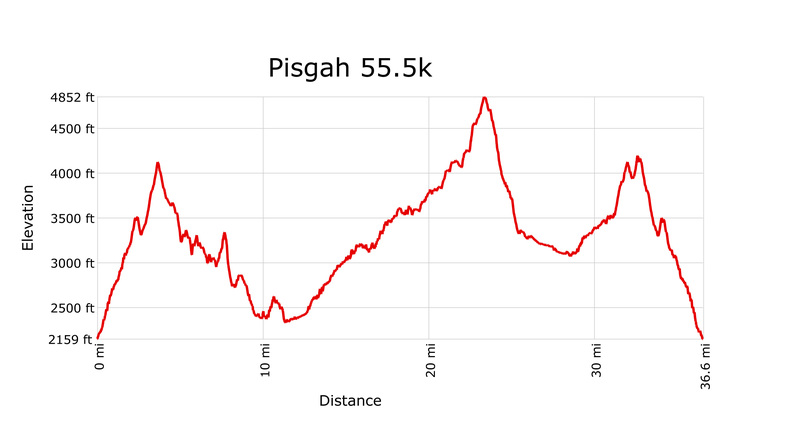 The Pisgah 55.5 will test the strength and endurance of racers by challenging them to complete a 55.5K course of nearly 100% Pisgah singletrack. The course traverses some of the great Pisgah classics: Black Mountain, Turkey Pen Gap, Laurel Mountain, and Pilot Rock! The Pisgah 55.5 is also open to Runners! Same course, same rest areas. Runners will leave the start/finish 5 minutes after the cyclists. Please note the day change! 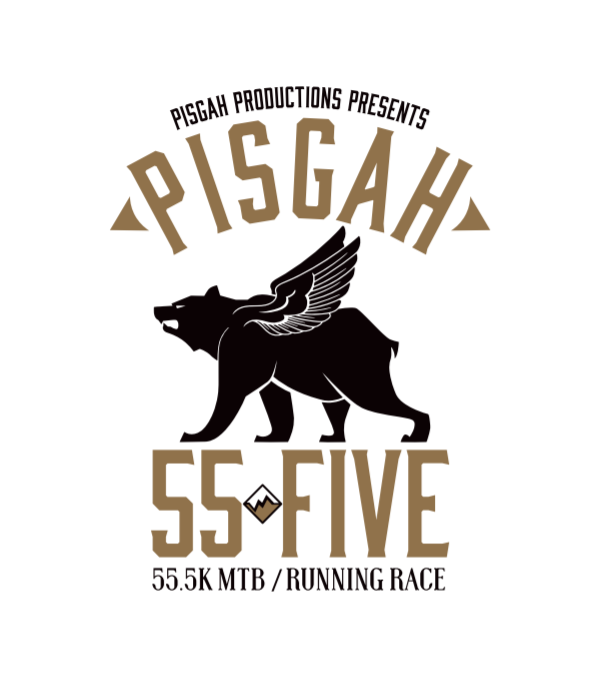 The 2019 Pisgah 55.5 will be held concurrently with the Pisgah 111! 5:00PM-10:00PM Friday - Registration and sign-in open. 5:30AM-7:30AM Saturday - Registration and sign-in open. 8:45AM Saturday - Racer meeting. 9:00AM Saturday - MTB race start. 9:05AM Saturday - Running race start. 4:00PM Saturday - Raffle drawing (you do not need to be present to win). 10:00PM Saturday - Race cutoff. 2. Riders must wear an approved cycling helmet at all times while on the bike. 3. Riders must complete the event on the bike they started on. No bike swaps during the event. 4. Riders and runners may receive outside support only within 100' of official rest areas. 5. Riders must stay in single-file except to pass. 6. Riders and runners must obey all local traffic laws. 7. Riders and runners leaving the fourth rest area after 6:00pm MUST HAVE AN EMERGENCY LIGHT. If you think you may need a light please pack it into your rest area four drop-bag. 8. Electric-Assist bikes (E-Bikes) are prohibited. 9. The Race Director reserves the right to disqualify any rider or runner for any reason deemed by race officials as unsportsmanlike or otherwise against the spirit of the event. 10. Rule infractions witnessed by Race Officials will result in disqualification. 11. Rule infractions NOT witnessed by Race Officials must be reported by members of TWO SEPARATE teams to be considered. 12. Protest period ends 30 minutes after the final team returns or 10:30PM Sunday, whichever comes first. 13. SIGN-IN upon completion of the event (Please, this includes DNF riders and runners). We have very limited parking. Please consider leaving your car someplace other than the start/finish. For example, there are a few very large lots at the intersection of NC276 and NC280. We will also be directing half of all vehicles that arrive to the Ranger Station. Please be prepared for that possibility. Please show up early. We will be selling raffle tickets (2 for $5) Prizes TBD. All proceeds will be donated to Asheville Humane Society. Please bring cash or checks. Drop-bags may be sent to each of the three rest areas. Please limit the size of your drop bag to a one gallon zip lock bag per rest area (approximately two large water bottles). Please bring your own bags. 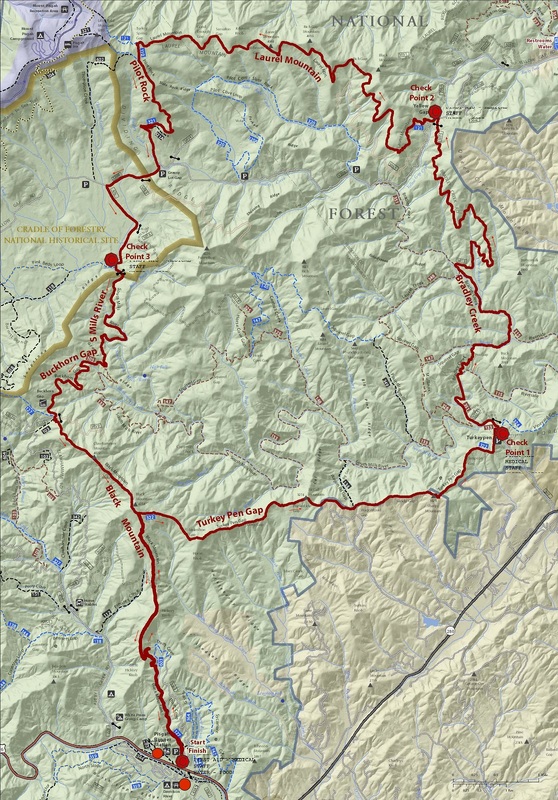 All gravel roads used in the Pisgah 55.5 will be OPEN to vehicle traffic. Please use common sense while on gravel roads. Stay to the right. Do not cut corners. Pass with care. Ride single file.